We started our first day here in Zagreb with something we’ve done in pretty much every country we’ve been to so far – went to the top of their 360 observation deck. We had free entry with our Zagreb Card* so made use of the time we had between breakfast and our walking tour which is coming up in this post. Zagreb is a much smaller city compared to those previously visited on this trip, so it has to be said that the views weren’t quite as spectacular, but from there we did spot the cathedral which is where we needed to head afterwards, and also the funicular. In similar style to the one leading up to Buda Castle in Budapest, this one connects the lower and upper town and is in fact the shortest funicular in the world – just 66 metres. Apart from the outdoor viewing area, there was a pretty funky lounging area where we enjoyed a cocktail each and attempted to play a board game we had no idea how to play! Onwards, and we had planned to meet our Hello Zagreb* walking tour guide at the fountain in front of this marvellous cathedral – the tallest building in the city. Hello Zagreb offer a number of different routes which can focus on anything from religion to food, but we opted for the intro tour of Zagreb, covering each aspect and seeing all of the main and typical sights here. After a tour of their fruit, fish and meat market, we made a stop for a quick beer (our kind of tour), and then to see this quite unusual tunnel. Now only used as an attraction, this tunnel was used as shelter during wars. From here we visited a few independent stores, selling typical Croatian products and inventions. These included olive oil which they are very well known for, truffles, figs, cravats and the mechanical pen. Now at Stone Gate, one of the city’s best attractions, we learnt that this was destroyed in the 18th century by fire, except for one painting of Mary and Jesus. This remains in place today as a place of worship, where you can light a candle and pray. Next we visited St Mark’s Church and admired the beautiful roof that it adorns. Close by is another of Zagreb’s best attractions – the Museum of Broken Relationships! We may just visit this properly tomorrow! After visiting Lortrscak Tower – where they fire from at 12pm everyday in tradition of how they used during war times, we saw the funicular from up close, and took a walk back to Ban Jelacic Square. The focal point here is the statue of a man riding a horse – this is in fact Ban Jelacic, whom the square was named after. We learnt so much in just a couple of hours from our great guide, Adam. 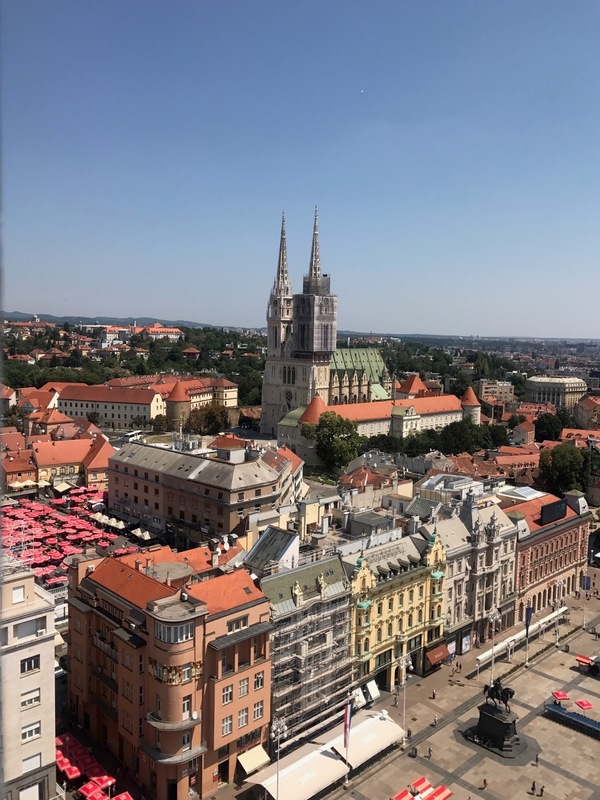 We couldn’t possibly squeeze every bit of knowledge in this post, but we can say that Hello Zagreb’s tours are absolutely fantastic and come highly recommended from us! Thank you Adam and Hello Zagreb for having us! Disclaimer: we were given a complimentary tour/cards to the asterisks (*) in exchange for a mention in this blog post and coverage on social media. However as always, all pictures and views are our own. I love the photos, such a great post! Absolutely love Croatia 🇭🇷 and one day hope to see more of the country including Zagreb! Look like you guys are having an amazing time!